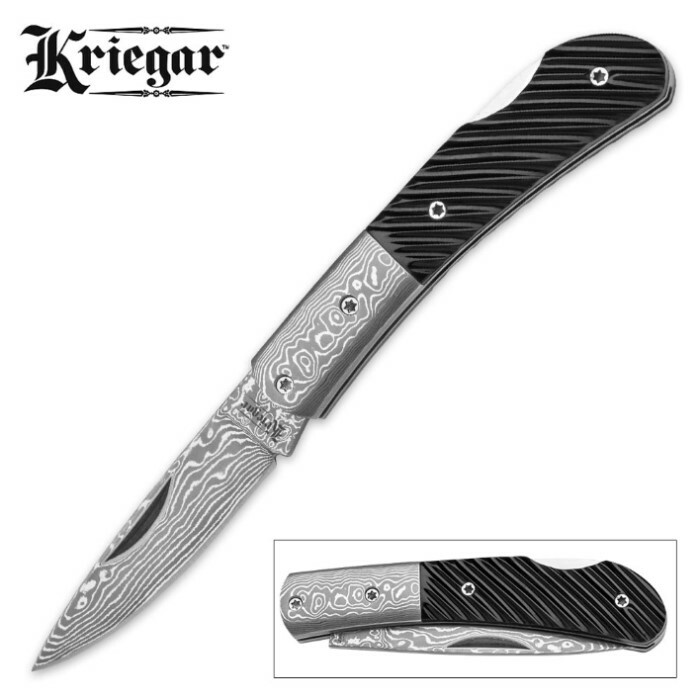 Kriegar "Nightcrest" Damascus Steel / Ox Horn Pocket Knife | BUDK.com - Knives & Swords At The Lowest Prices! The Kriegar Nightcrest packs a lot of striking beauty in a conveniently small pocket knife. At 3 1/2" closed, the Nightcrest fits comfortably in jeans and even shirt pockets without being annoyingly bulky or cumbersome. But make no mistake - there's plenty of raw cutting power in this little folder. 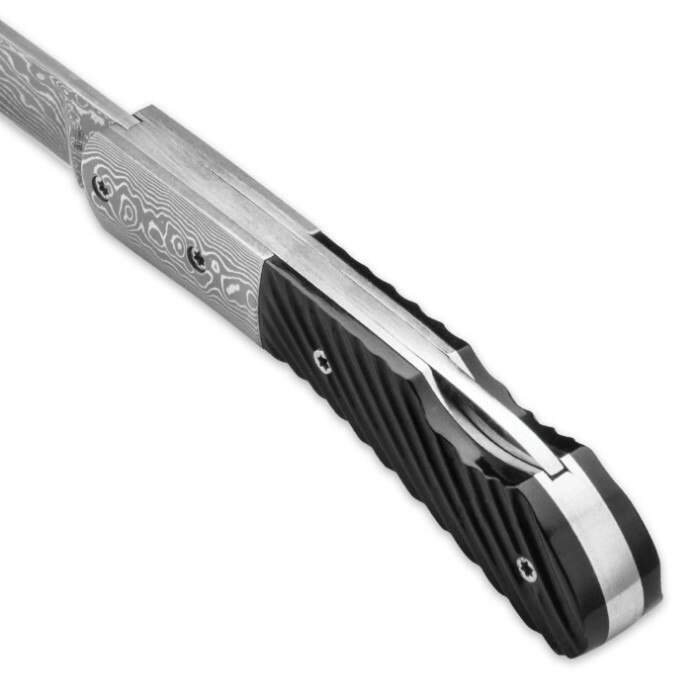 Its 2 5/8" drop point blade is forged from breathtaking Damascus steel, carefully honed to a razor sharp edge that's plenty sufficient for everyday cutting jobs and then some. The handy lockback mechanism affords stability during vigorous chores. 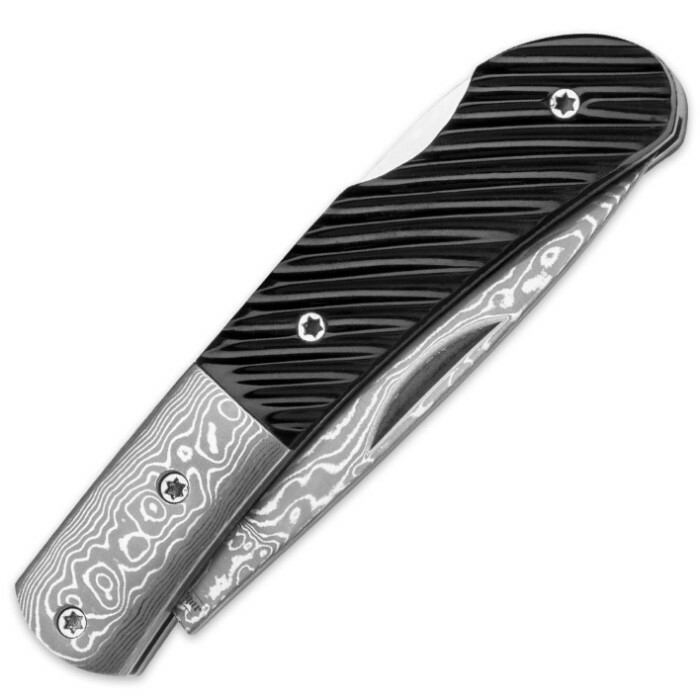 Damascus steel continues onto the Ripple's sizable bolster. The myriad swirls, waves and ripples naturally present in the legendary steel complements the gentle furrows of the genuine ox horn handle perfectly. Polished to a satiny smooth gloss, the ridged ox horn handle boasts an extraordinary feel and a stunning deep onyx hue. All these features combine to make the the Nightcrest equally well suited to everyday use or the display case. Regardless of what you decide to do with it, however, rest assured your top quality Kriegar Nightcrest Pocket Knife is in it for the long haul.